Few types of cuisine are hard to find anymore. Mexican and Tex-Mex are readily available, Indian buffets are standard fare, sushi just seems to keep growing in popularity, and Chinese, Thai, and Vietnamese are easily accessible. And food experts claim that Peruvian and Korean cuisine are the fare du jour. So what’s the next fad food? Andrew Zimmern, host of “Bizarre Foods” on the Travel Channel, has a theory: “I predict, two years from now, Filipino food will be what we will have been talking about for six months … I think that’s going to be the next big thing,” he told TODAY.com. Filipino cuisine has a variety of foreign influences. The impact of China is evidenced in their use of noodles (pancit), fried rice (sinangang) and spring rolls (lumpia), as well as the soy sauce and fish sauce found in many other dishes. Indonesian and Malaysian influence can be seen in the use of coconut milk and rice, particularly in desserts, as well as the use of chilis (though most Filipino food isn’t very spice-heavy). The Spanish were responsible for bringing bay leaves, tomatoes and garlic, as well as the technique of sautéing with olive oil. Longanisa is a sweet pork sausage (similar to the Spanish longaniza) which can be found in Filipino dishes. Other Spanish dishes often found on Filipino menus are flan, paella, and adobo, a method of braising meat in garlic, vinegar, peppercorns, and soy sauce. Filipino food isn’t on the radar of mainstream America, but Zimmern thinks that’s going to change. “San Diego is now a big enough ethnic population of Filipinos that chefs are going there and seeing stuff. I think it’ll creep up into Los Angeles and from there go around the rest of the country,” he foresees. 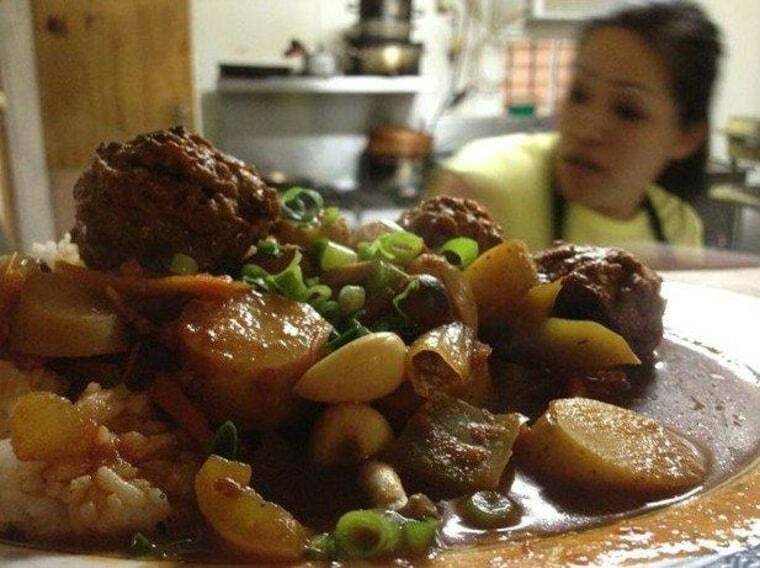 Cristina Quackenbush is the head chef and proprietor of Milkfish, a popular Filipino pop-up restaurant found inside Marie’s Bar, a Marigny neighborhood favorite in New Orleans. “I have grown up cooking Filipino food from my mother and learning homemade-from-scratch fare from my grandmother. She had 20 acres of land in which she had planted every fruit and vegetable you can think of!” she told TODAY.com. Spam started being used in Filipino cooking during World War II and remains a popular ingredient. The following recipe is a typical breakfast dish, served with an over-easy egg. Try it and you might just be pleasantly surprised (I was!). Dice Spam into 1/4-inch cubes and sauté in canola oil until crisp on outside; add onions and garlic and cook until onions are translucent. Add cooled rice and 1/8 cup of oil. Mix rice thoroughly with Spam, onions and garlic. Add 1/8 cup of soy sauce and be sure sure to distribute evenly over mixture. Flatten out rice and let brown slightly. Stir again and flatten out and fry slightly. Make a hole in middle of rice and break egg into it. Let egg cook as you gradually incorporate it into the rice. Add rest of soy sauce and oil and stir fry until egg is cooked completely. Season with salt and pepper. Add diced tomatoes over top and fry an over-easy egg for the top to finish! Veronica Meewes is an Austin-based freelance writer who will travel for food but always comes back for breakfast tacos. Follow her on Twitter @wellfedlife and visit her blog.